Burnley are ready to offer Joey Barton the chance to train with the club following the controversial midfielder’s exit from Rangers. Sean Dyche’s side are favourites to sign Barton when the player becomes available again in the January window but the Turf Moor manager was reluctant to look too far forward at this stage. Barton impressed for the Clarets during last season’s successful Championship campaign before moving on to his ill-fated stay at Ibrox. Dyche said: “There are lots of players in my past that I’ve helped out and, if he felt he needed a base to get fit, I’d listen. “If Joey requires our support here then he’d get that. If he doesn’t, he’ll move forward to wherever he needs to move forward to. Barton is now a free agent by can’t register with another club until the window opens in January. 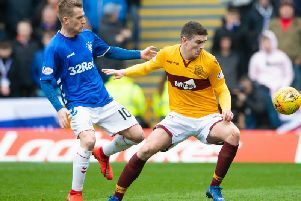 He turned down the offer of a new Burnley contract last summer to join Rangers. His time at Ibrox was brief as he left the club earlier this month following a six-week suspension for falling out with manager Mark Warburton.